This text records and examines in detail both the modern and vernacular architecture of the Sultanate of Oman. For many centuries, because of its strategic position on the trade routes for frankincense, myrrh and other goods, Oman's architecture has been subject to the influx of a variety of styles and influences - Indian, East African, Portuguese and British. Yet despite these influences, shared with neighbouring countries, Oman's architectural style remains distinct from the rest of the Arabian peninsula. The Sultanate's landscapes are striking in their contrasts - from the powerful, primary blues and greens of the country's lush oases and the Indian Ocean that laps at its shores, to its arid deserts and rugged mountains. There is a primordial quality in the art of its architecture, imbuing it with a spirit of minimalism and austerity, qualities which have defined the extent and form of architectural construction and urban growth, from the smallest vernacular towns of the interior and coastal regions, to the impressive modern buildings of the Sultanate's capital, Muscat. To date, little of this rich and varied architecture has been documented. With a combination of her own original research based on extensive fieldwork and surveys, and previously unpublished drawings, plans, illustrations and surveys from architects working in Oman, coupled with first-hand accounts from local master builders, Dr Damluji has succeeded in compiling as definitive work on the architecture of the Sultanate. 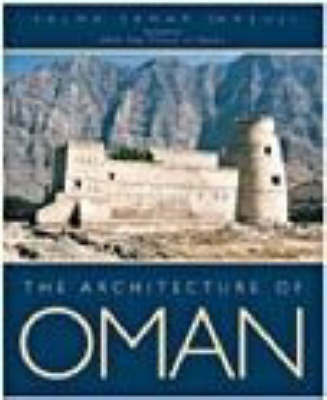 By investigating traditional and modern building processes, urban planning and design concepts, and with thorough contributions from other specialists, Dr Damluji analyses, from an architectural viewpoint, the extent of Oman's success compared with many other developing countries in maintaining its rich cultural heritage in the face of the demands necessitated by a rapidly changing urban landscape.